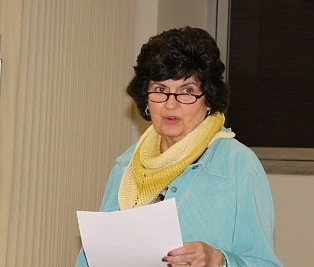 First of all, thanks to everyone who joined us for the October Meeting! We had a great time getting together. We announced our first Knit-a-Long for 2011, the Grove Mittens! Brooklyn Tweed (aka Jared Flood) is a fabulous designer/teacher/knitter who is offering our guild a special discount! 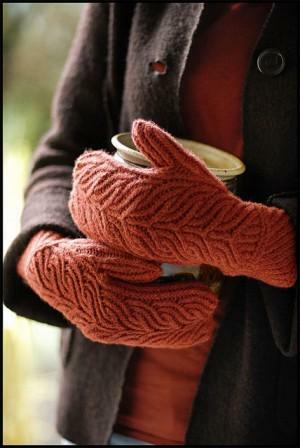 Anyone who participates in the KAL can purchase the Grove Mittens pattern at a 25% discount! Like I said, Jared is Awesome! Finish with a fabulous pair of mittens for yourself or as a special gift! We decided last night that we will start a Ravelry thread where people can post their progress and questions. We will also schedule any impromptu meetings we decide to have. Check out the full details here. Click for Babies! 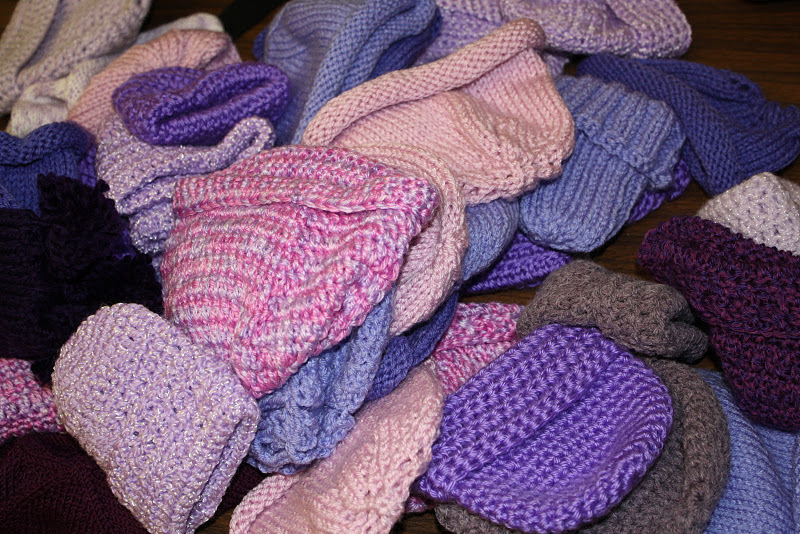 Thanks for knitting & crocheting more than 60 newborn baby hats! This national campaign is raising awareness for child abuse prevention. We collected a TON of hats at the October meeting!!! If you are still working on more hats, you can drop off your hat(s) at Odd Balls Yarn Shop or Twist. Click on the link above for more details. Oh, and for all of you competitive knitters out there, Kansas is currently in 3rd place across the whole nation and Canada!! Come On! Plus it’s good for the babies. 🙂 Details can also be found on our blog and Ravelry group pages. Kiersten posted details for another project. This one has a super short deadline, but we thought a few of you crazy knitters just might be able to whip out a red scarf. The Red Scarf Project collects scarves that will be sent in a Valentine’s Day Care Package to an Foster Care to Sucess student enrolled in college or trade school. We need to collect these at the November Guild Meeting or for a little more time, you can drop them off to Kim Neufeld or Odd Balls Yarn Shop up until December 1st. If you think of any additional committees or are interested in helping with one of these, please let one of the CKKG Board Members know! Sandee Zerger led us through the wonderful finishing technique, I-Cord Bind Off. Many of us mentioned that we love using I-Cord in our knitting, but hadn’t tried the Bind Off or Cast On. Sandee discussed how this technique is good for edging a pocket, edging a garment (especially if you plan to put in a zipper), pillows and basically anything that you want a nice clean edge to. We also discussed how you can work this method on live stitches or you can pick up stitches alon any edge and then work the bind off technique. Kim also mentioned that her FAVORITE use of these techniques is the Menorah Pillow from Handknit Holidays. Kim has used the same pattern details to make all sorts of pillows. You actually seam your front & back pillow peices together as you work the I-Cord Bind Off! Talk about a super slick design! Sandee & Kim provided handouts on the Bind Off & Cast On techniques. 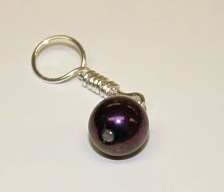 Julie Miller, a local jewelry artist, demonstrating how to make custom stitch markers. 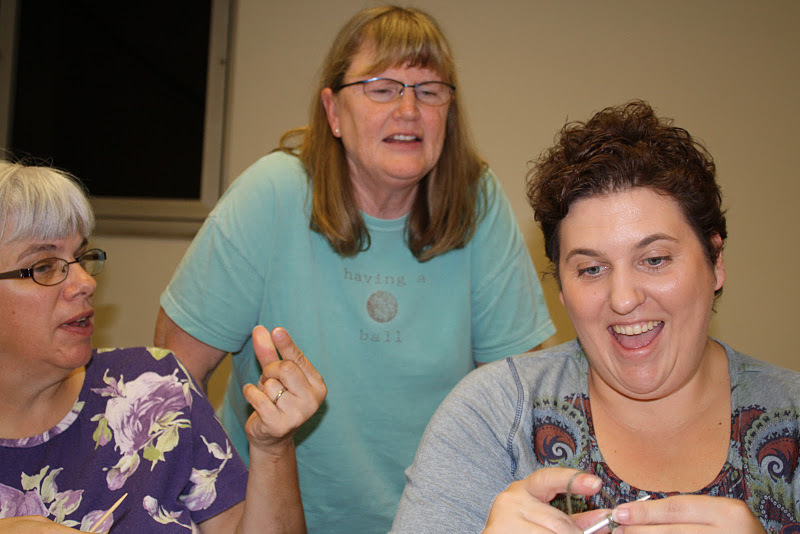 Julie Miller (Jewelry Artist Extraordinaire) led us through a demonstration of making your very own beaded stitch markers…and we’re not talking about the “just add a few beads to a jump-ring sort of marker). No no, Julie showed us how to use wire to make the stitch marker as large or small as you like, plus these won’t snag on your knitting. I’m thinking these would make the best holiday gifts for my knitting buddies (that I don’t actaully have time to knit for)! *Please let us know if you have suggestions for future classes! Carpool Sign Up Sheet for Yarn Hop: we will have sign up sheets for the Central Ks Yarn Hop and will post threads on Ravelry. If you are interested in visiting some of the stores with fellow knitters, speak up! Carpool for meetings: we now have members all across Central KS and would like to start up some carpooling groups from the local communities. If you are interested in helping organize one from your city, let us know! Anyways, thanks to everyone for helping make a great meeting. Stay tuned…clearly there is A LOT more to come! See you next month, Thursday November 10th from 6-8pm – Harvey County Courthouse (Newton). Previous Previous post: October Guild Meeting!